An invitation from #visitkoeln lands in my in-box for a three-day food camp right on my doorstep. The programme kicks off with a Kölsch tasting with beer sommelier Torsten Goffin in the city’s youngest brewery pub, where we try 11 different types of Kölsch, and a crash course on the Cologne food scene: from a Neapolitan god of pasta to experts in all things burger to innovative cuisine with a local taste to NENI, the restaurant of the 25hours Hotel The Circle, with its unbeatable view of the city. My “takeaways”: 1) Not all Kölsch is the same. 2) Innovative cuisine can have a local heart. 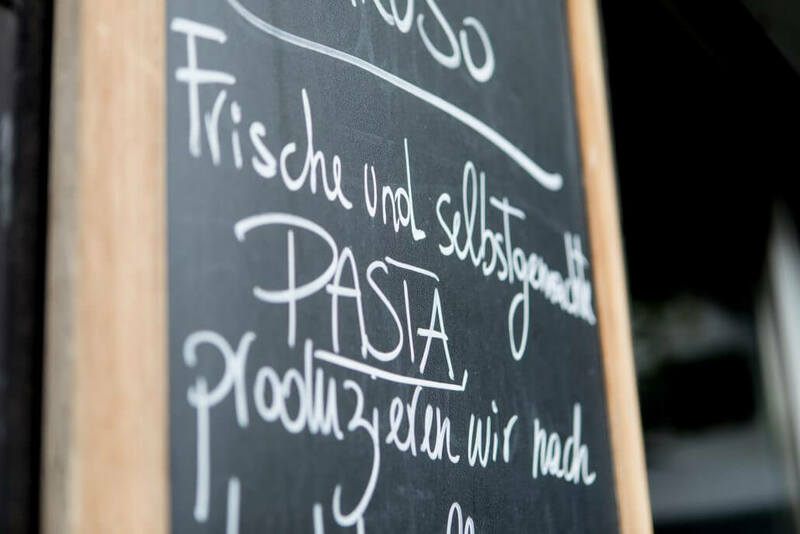 And 3) Cologne’s food scene is varied and exciting. Barbarossaplatz is one of Cologne’s busiest traffic junctions: loud, slightly chaotic and seriously urban. Here, of all places, is where we find Marcello and Anna Caruso’s Pastabar di Caruso. The delightful duo from Naples have been running their wonderful restaurant, a little piece of Italy, for five years. They’re more than accustomed to noise and traffic mayhem in their home city, so their location on Barbarossaplatz actually gives them a great sense of home. The small pasta bar just about fits 20 seated and is almost always fully booked at the weekends. Word has long since got around about Marcello’s phenomenal culinary skills. “My husband’s cooking is like Mama’s. It’s like our guests are dining in our home, not in a restaurant”, says Anna with a smile. The walls are adorned with photos of Sophia Loren, old drawings of Amalfi lemons and boards detailing the daily specials. 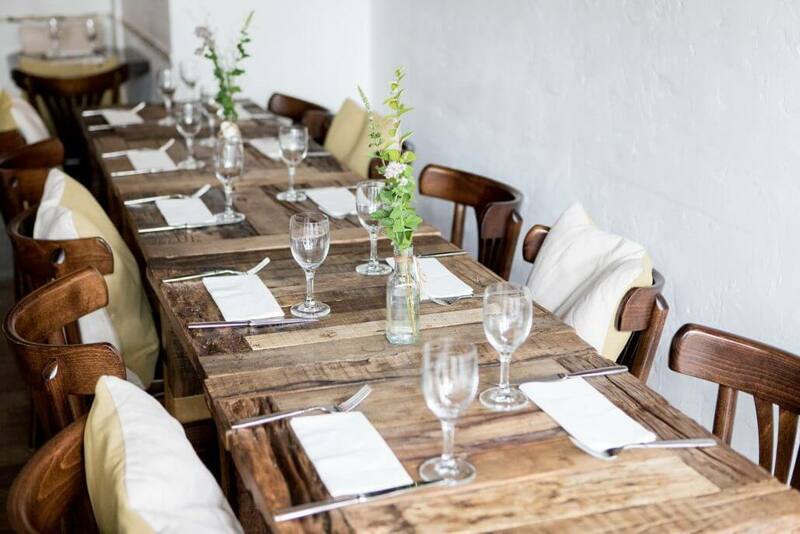 The rustic wooden tables are decorated with fresh flowers. Guests immediately feel at home and, above all, welcome. Marcello is a true pasta virtuoso. Each piece, be it spaghetti or ravioli, is fashioned by hand and cooked with love. You can really taste the care that goes into the dishes. The tortellini with braised lamb, ricotta and oregano would be a delight in itself but Marcello gives this classic the perfect finishing touch by adding pumpkin creme and toasted hazelnuts. And Anna serves a wine to complement. La Dolce Vita at Barbarossaplatz. 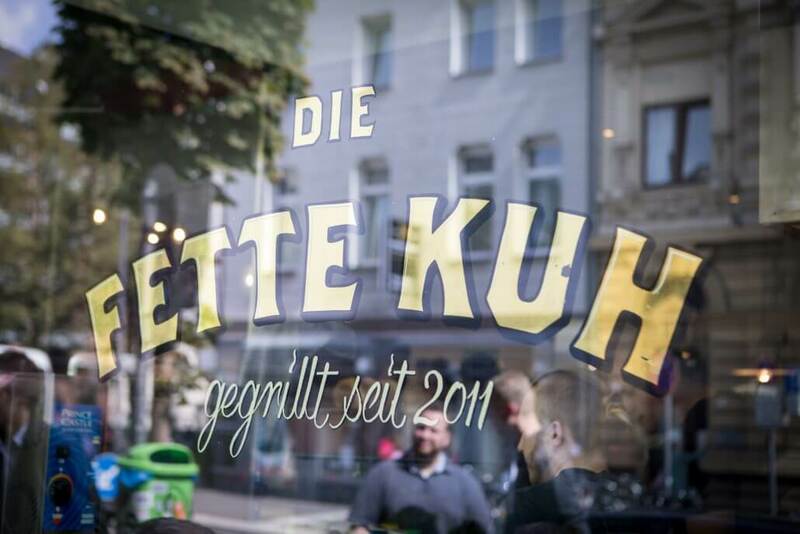 Die Fette Kuh was one of the city’s first burger places and has long been an established part of the food scene here. At peak times, it’s not unusual to see customers queuing up the road to the next junction. After all, a really good burger is worth the wait. What makes this burger institution in the southern part of the city such an institution is the top-quality meat. It goes without saying that they won’t reveal their supplier though – that’s their most important business secret! All you can get out of them is “grass-fed cattle from the Lower Rhine region”. Though the culinary focus here is regional, there are sometimes international influences to be found on the menu, such as the teriyaki burger. 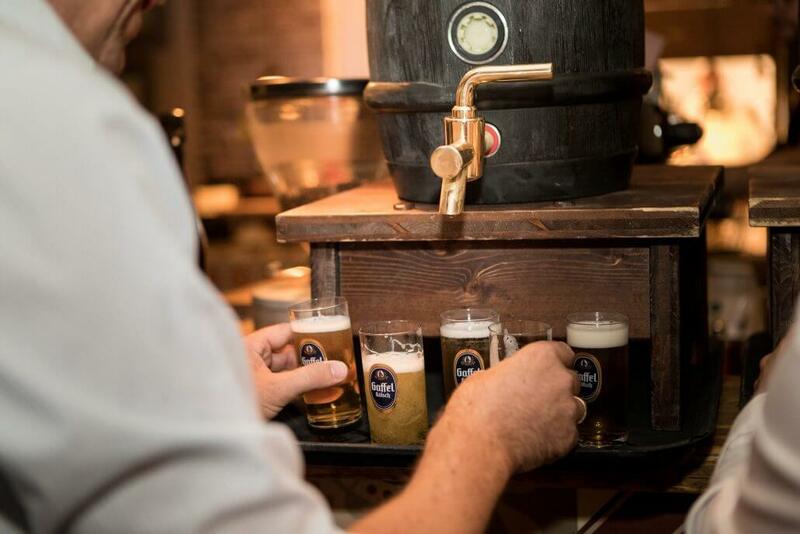 Die Fette Kuh has its bread rolls baked especially by a bakery in the region and exclusive beers brewed by expert Sebastian Sauer in Hagen, just over an hour away. 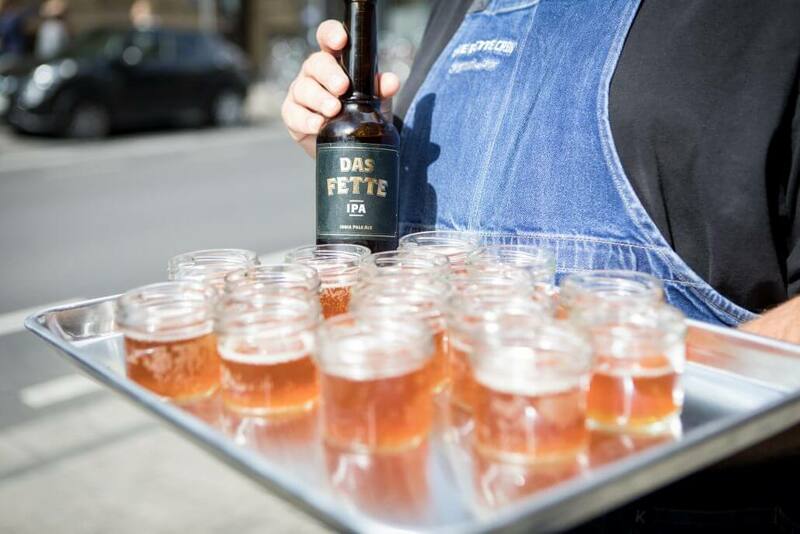 The range features classics such as “Das fette Wiess”, a Cologne-style brew, and “Das fette IPA” with five types of hops, as well as out-of-the ordinary beers made from avocado and sweet potato. And, to make things even meatier, the team behind “Die Fette Kuh” has opened up another place, “Wurst Case Szenario” on Brüsseler Platz. 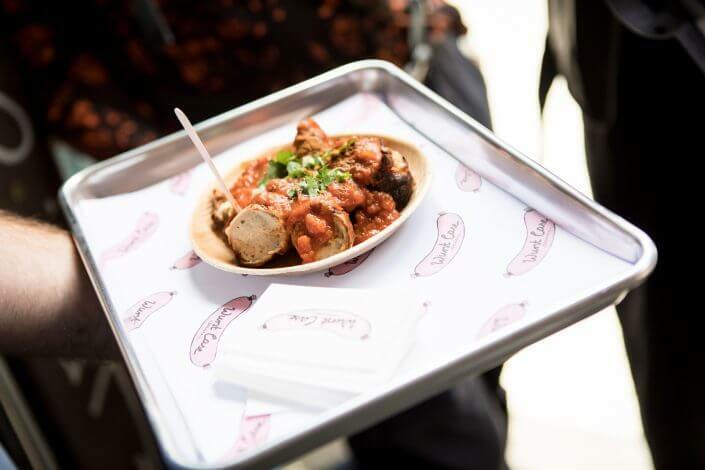 A sausage boutique of the best kind. Again, the food here is all about excellent meat but this time in the shape of sausage. 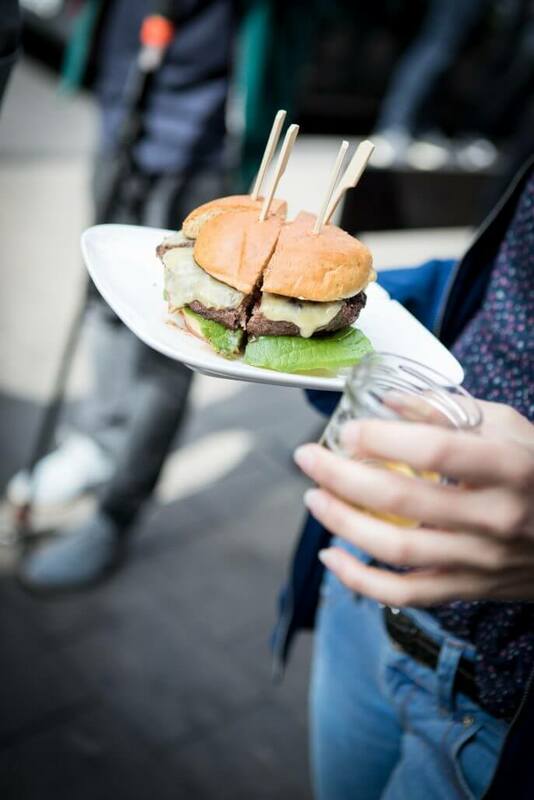 These guys are quite simply grill gurus, be it burger patties, bacon or Bratwurst that they’re dishing up. 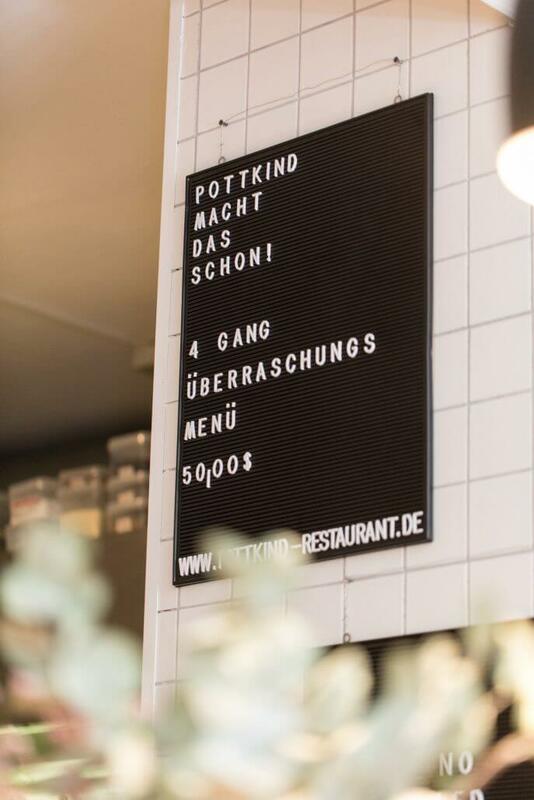 Pottkind is the most exciting new eatery to hit the southern part of Cologne. Enrico Sablotny and Lukas Winkelmann met in the kitchen of Restaurant Acht and eventually decided to open their own place. Their extremely ambitious style is based on classic French cuisine, with a modern German take and international influences. It might sound a little confusing to start with but it all makes perfect sense on the plate. 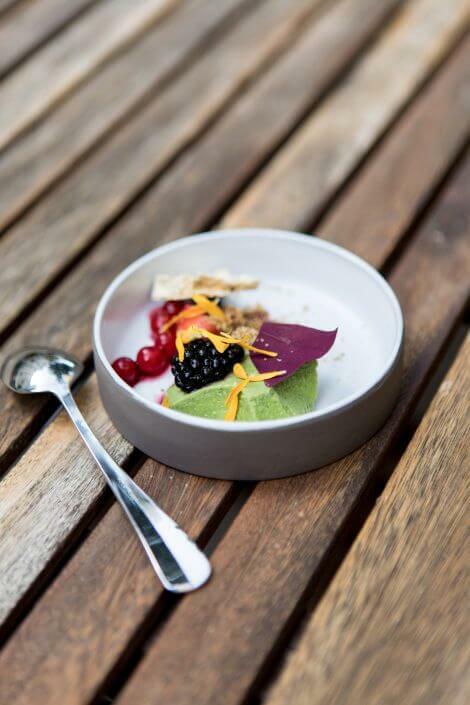 Take the marinated berries with sorrel mousse and liquorice meringue, for instance. Marinated fruit, mousse and meringue are typical components of French patisserie, the sorrel grows locally and the idea of liquorice in deserts comes from Scandinavia. Not only does the result look beautiful – it tastes great too. And the wine selection is at least as exciting as the menu. Pottkind completely rejects the idea of being a stiff gourmet restaurant sein, preferring the concept of “bistronomy”. 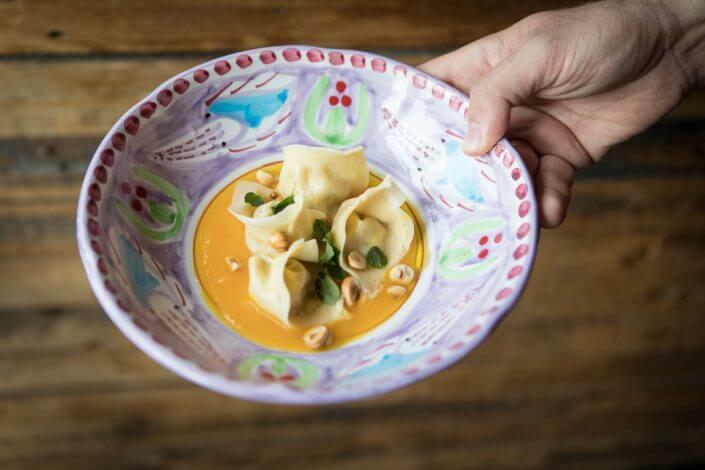 Modern, down-to-earth, communicative – that’s what the two young restaurateurs are striving for. 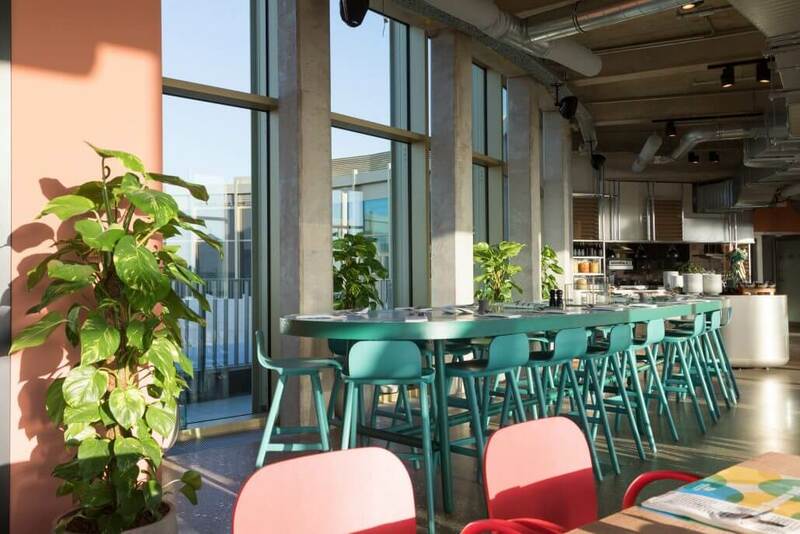 The open design of the restaurant, including the open kitchen, was particularly important to them. “We want guests to be able to see how their food is prepared and ask questions”, says Lukas, explaining their approach. Incidentally, the name “Pottkind” refers to where the proprietors come from – the Ruhr District. But they decided to make Cologne their home because this is where they found love. Surely that’s got to be the nicest thing anyone can say about a city? 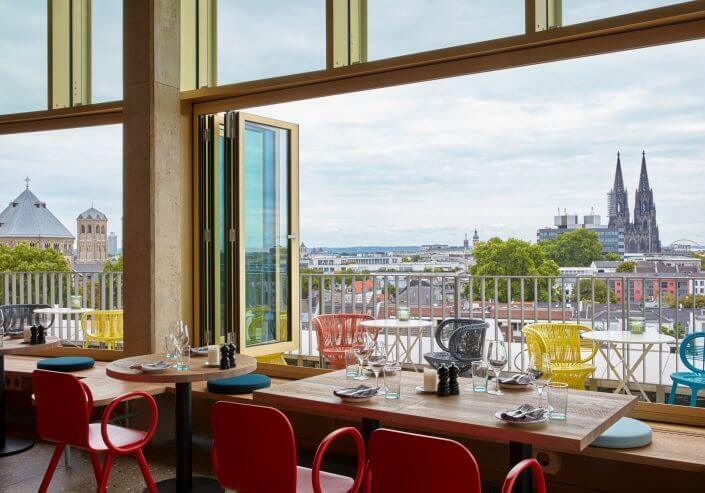 Neni, the fresh, hip restaurant on the eighth floor of the newly opened 25hours Hotel The Circle, has a fantastic view across Cologne that’s enough to win anyone over. The restaurant has an open design, bathed in light, with hanging plants and geometric lamps dangling from the ceiling. The service team is young and dedicated. 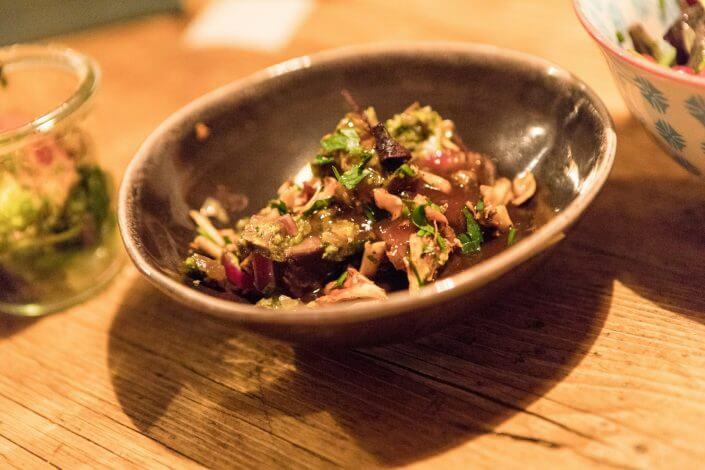 In keeping with the latest trend to hit Germany, the food served in “Neni” is Middle East cuisine. Hummus in three colours, falafels, pitta, smoked aubergine, chicken shawarma and sabich. The dishes come in mezze portions, intended to be placed in the middle of the table. Everyone tries a little bit of everything, chatting about the experience as they eat. “Have you tried the hamshuka yet? It’s delicious.” “No but this baba ganoush tastes wonderful with the vegetarian cigars stuffed with spinach and feta.” It’s communicative, fun and tastes great. And the priceless view of Cologne’s cityscape comes free of charge. Cologne is well-known for its brewery and beer culture and now tireless Cologne restaurateur Till Riekenbrauk has teamed up with two of his fellow restaurateurs to open a young brewery in the Riekenbrauk mould. 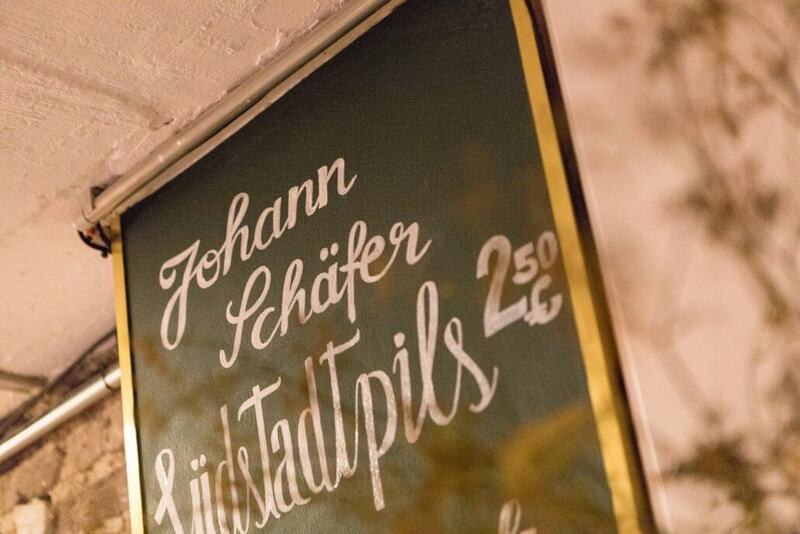 Johann Schäfer is a meeting place for the locals in Cologne’s southern district to get together and enjoy craft beer and superb food. 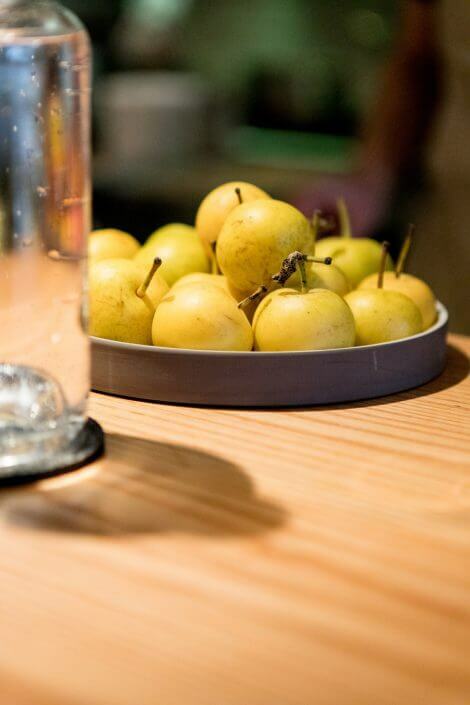 Regional and seasonal produce are particularly important to the team. The bread is baked fresh daily, using a sourdough starter they make themselves. All of the other products come from artisan suppliers. 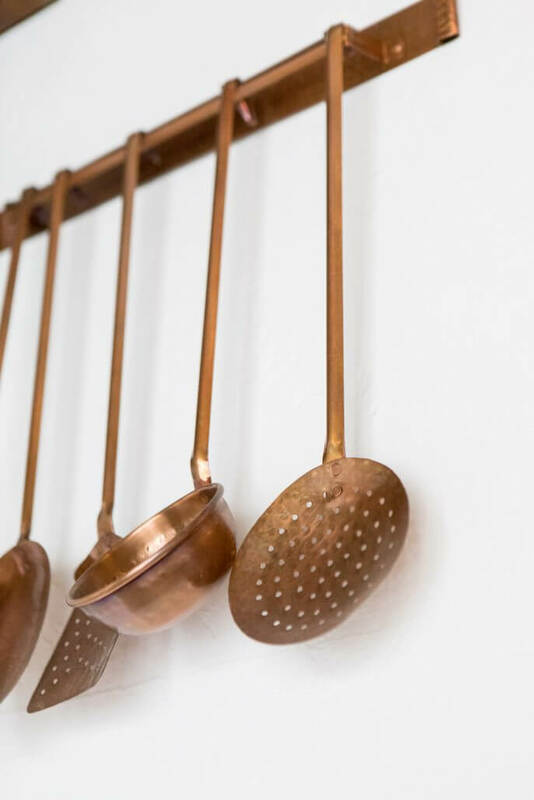 The cuisine is head to hoof, with dishes such as jellied meat, spare ribs, tartare and roast beef all featuring on the menu. Although brewery cuisine is typically not very vegetarian-friendly, there are wonderful vegetable and salad dishes at Johann Schäfer, such as stewed cucumber with millet and watercress, fried portobello mushrooms with apricot salsa, smoked almonds and red chard and glazed romaine hearts with Styrian mountain cheese, organic egg yolk and wheat stock. 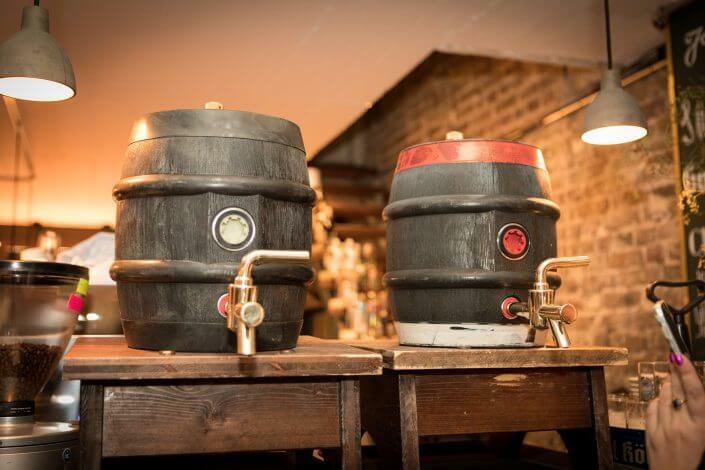 Naturally, the beer has a starring role. Johann Schäfer has its house beers, “Südstadt-Pils” and “Chlodwig-Weizen”, brewed especially but Kölsch is also available too of course. 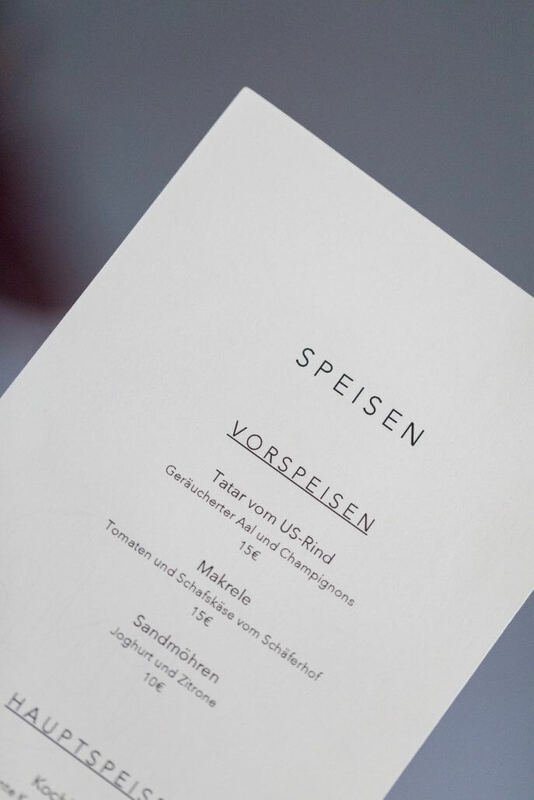 In another innovative move for the brewery business, the wine list is decent, with fairly priced wines from German vineyards and nothing you’ll wake up regretting.